, an eminent engraver and painter, descended from an Hongarian family, was born at Nuremberg May 20, 1471. Having made a slight beginning with a pencil in the shop of his father, who was a goldsmith, one Martin Hupse taught him a little of colouring and engraving. He was also instructed in arithmetic, perspective, and geometry and then undertook, at twenty-six years of age, to exhibit some of his works to the public. His first work was the three Graces, represented by three naked women, having over their heads a globe, in which was | engraved the date of the year 1497. He engraved on wood the whole life and passion of Christ in thirty-six pieces, which were so highly esteemed, that Marc Antonio Franci copied them on copper, and so exactly, that they were thought to be Albert’s, and sold as such. 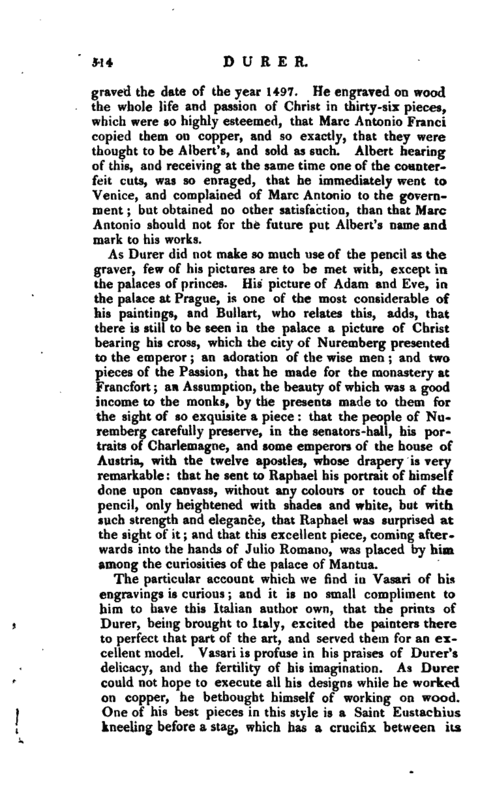 Albert hearing of this, and receiving at the same time one of the counterfeit cuts, was so enraged, that he immediately went to Venice, and complained of Marc Antonio to the government; but obtained no other satisfaction, than that Marc Antonio should not for the future put Albert’s name and mark to his works. As Durer did not make so much use of the pencil as the graver, few of his pictures are to be met with, except in the palaces of princes. His picture of Adam and Eve, in the palace at Prague, is one of the most considerable of his paintings, and Bullart, who relates this, adds, that there is still to be seen in the palace a picture of Christ bearing his cross, which the city of Nuremberg presented to the emperor; an adoration of the wise men; and two pieces of the Passion, that he made for the monastery at Francfort; an Assumption, the beauty of which was a good income to the monks, by the presents made to them for the sight of so exquisite a piece: that the people of Nuremberg carefully preserve, in the senators -hall, his portraits of Charlemagne, and some emperors of the house of Austria, with the twelve apostles, whose drapery is very remarkable: that he sent to Raphael his portrait of himself done upon canvass, without any colours or touch of the pencil, only heightened with shades and white, but with such strength and elegance, that Raphael was surprised at the sight of it; and that this excellent piece, coming afterwards into the hands of Julio Romano, was placed by him among the curiosities of the palace of Mantua. The particular account which we find in Vasari of his engravings is curious; and it is no small compliment to him to have this Italian author own, that the prints of Durer, being brought to Italy, excited the painters there to perfect that part of the art, and served them for an excellent model. Vasari is profuse in his praises of Duivr’s delicacy, and the fertility of his imagination. As Durer could not hope to execute all his designs while he worked on copper, he bethought himself of working on wood. One of his best pieces in this style is a Saint Eustachius kneeling before a stag, which has a crucifix between its | horns which cut, says Vasari, is wonderful, and particularly for the beauty of the dogs represented in various attitudes. John Valentine Andreas, a doctor in divinity in the duchy of Wirtemberg, sent this piece to a prince of the house of Brunswick; to whom the prince replied by letter, “You have extremely obliged me by your new present; a cut which merits a nobler metal than brass, done by the celebrated painter of Nuremberg, and which, I think, wants nothing, unless Zeuxis or Parrhasius, or some person equally favoured by Minerva, should add colours and the native form.” The praises which this same divine gave to Durer in his answer to the prince’s letter, are remarkable, and worth transcribing: “I could easily guess,” says he, “that the Eustachius of Durer would not prove an unacceptable present to you, from whatever hand a performance of that admirable artist came. 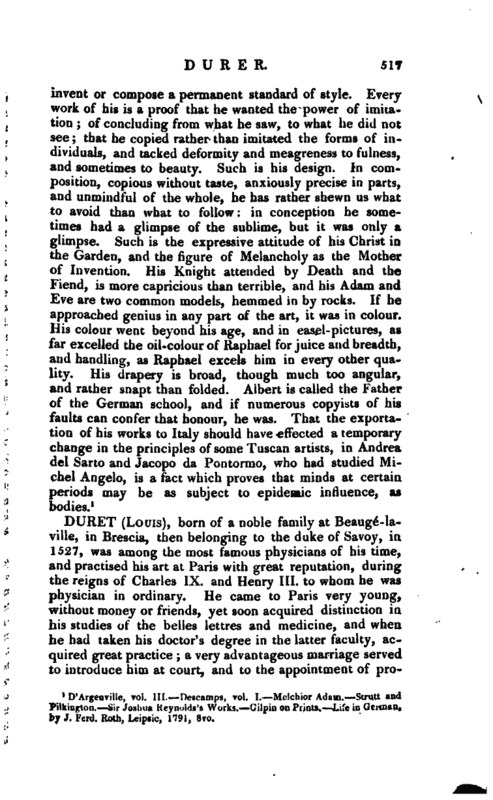 It is very surprising in regard to that man, that, in a rude and barbarous age, he was the first of the Germans who not only arrived to an exact imitation of nature by the perfection of his art, but likewise left no second; being so absolute a master of it in all its parts, in etching, engraving, statuary, architecture, optics, symmetry, and the rest, that he had no equal, except Michel Angelo Buonaroti, his contemporary and rival; and left behind him such works as were too much for the life of one man. He lived always in a frugal manner, and with the appearance of poverty. The Italians highly esteem him, and reproach us for not setting a due value on the ornaments of our own country.” We learn from the same authority, that the emperor Rodolphus II. ordered the plate of St. Eustachius to be gilded; and that Durer, at the intimation of his friend and patron Bilibaldus Pirkheimer, corrected an error in it, which was, that the stirrups of the horse on which Eustachius was to ride, were too short. 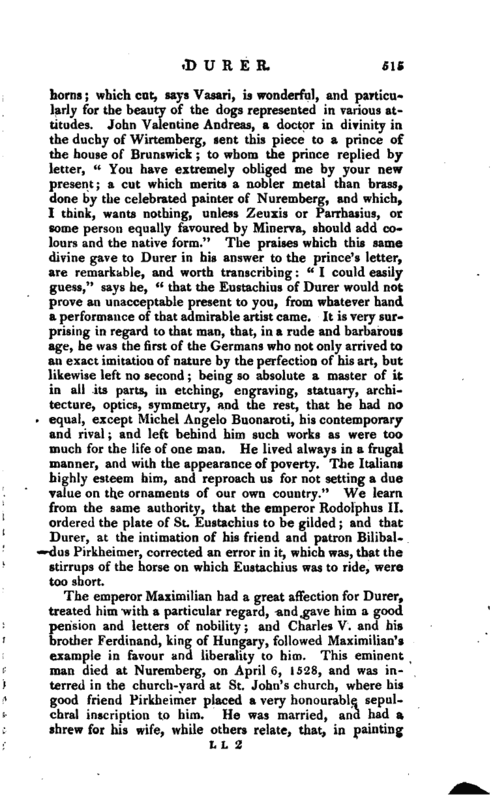 The emperor Maximilian had a great affection for Durer, treated him with a particular regard, and gave him a good pension and letters of nobility; and Charles V. and his brother Ferdinand, king of Hungary, followed Maximilian’s example in favour and liberality to him. This eminent man died at Nuremberg, on April 6, 1523, and was interred in the church-yard at St. John’s church, where his good friend Pirkheimer placed a very honourable sepulchral inscription to him. He was married, and had a shrew for his wife, while others relate, that, in painting | the Virgin Mary, he took her face for his model it is not impossible that both these accounts may be true, and it is very certain that she embittered his life. He Was a man of most agreeable conversation, and a lover of mirth; yet he was virtuous and wise, and, to his honour be it said, never employed his art in obscene representations, which was too much the fashion of his times. 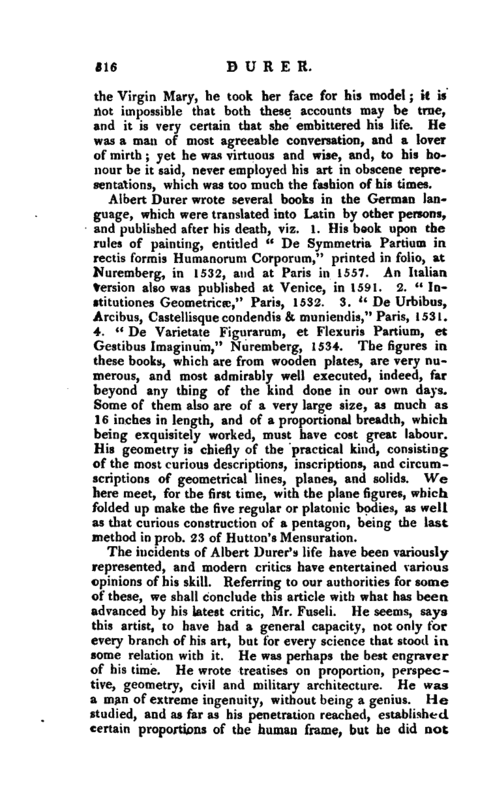 Albert Durer wrote several books in the German language, which were translated into Latin by other persons, and published after his death, viz. 1. His book upon the rules of painting, entitled “De Symmetria Partium in rectis formis Humanorum Corporum,” printed in folio, at Nuremberg, in 1532, and at Paris in 1557. An Italian Version also was published at Venice, in 1591. 2. “Institutiones Geometries,” Paris, 1532. 3. “De Urbibus, Arcibus, Castellisque condendis & muniendis,” Paris, 1531. 4. <c De Varietate Figurarum, et Flexuris Partium, et Gestibus Imaginum," Nuremberg, 1534. The figures in these books, which are from wooden plates, are very numerous, and most admirably well executed, indeed, far beyond any thing of the kind done in our own days. Some of them also are of a very large size, as much as 16 inches in length, and of a proportional breadth, which being exquisitely worked, must have cost great labour. His geometry is chiefly of the practical kind, consisting of the most curious descriptions, inscriptions, and circumscriptions of geometrical lines, planes, and solids. We here meet, for the first time, with the plane figures, which folded up make the five regular or platonic bodies, as well as that curious construction of a pentagon, being the last method in prob. 23 of Hutton’s Mensuration. D’Argcnville, vol. III. —Descamps, vol. I. Mclchior Adam. —Strutt and Pilkington. 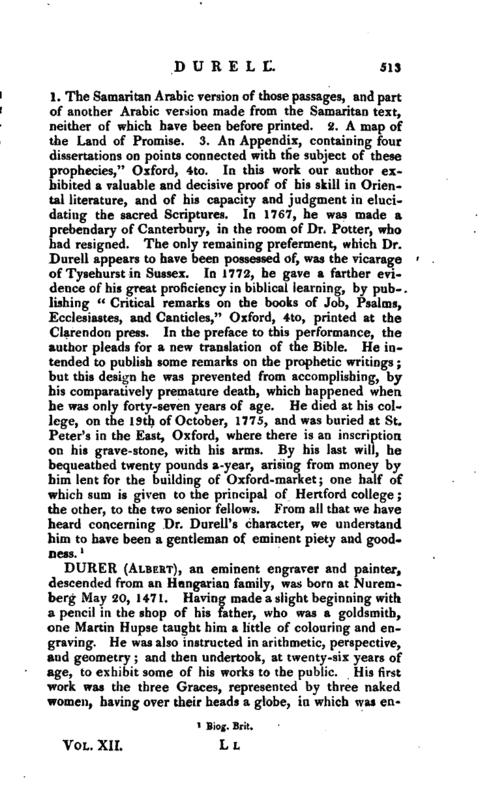 Sir Joshua Reynokls’s Works. Uilpin on Prints. Life in German, by J. Ferd. Roth, Leipsic, 1791, 8vo.